This Saturday please come out to celebrate our dear spiritual guide Srila Bhakti Pavan Janardan Maharaj, acharya of this Ashram and long time leader and inspiration to so many practitioners of bhakti yoga in the mission of Sri Chaitanya Saraswat Math. Vaidehi Normand is collecting short written offerings, so please send one her way if you’re inspired to. Reply to this email if you need her contact info. This event is a joyful opportunity to give due honor to Srila Janardan Maharaj and cherish our good fortune to have his spiritual guidance and leadership in our lives. There will of course, be a delicious feast afterwards. I pray for your good association and that everyone will join together affectionately on this very happy and important day for our community. 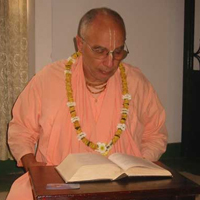 “We have had the supreme good fortune of knowing Janardan Maharaj for so many years in ISKCON and even beyond. Not to embarrass Janardan Maharaj, but his depth of humility is so astonishing and so deep and so inspiring. Even when he was in ISKCON he was very well known and he had temples and money and all kinds of devotees at his disposal, but when Srila Prabhupad departed and he heard about Srila Guru Maharaj, he wanted to come to Srila Guru Maharaj. He felt something in his heart so strong for Srila Guru Maharaj and he very easily just left everything behind him to come to Srila Guru Maharaj…. The first chapter begins with fourteen Sanskrit verses giving ontology so that we can understand the pastimes and what is going to be presented in the Sri Chaitanya Charitamrita. The first six verses describe Mahaprabhu, then the next five describe Nityananda Prabhu. The next two verses describe the truth of Adwaita Prabhu and the following verse describes the Pancha-tattva. An excerpt: “Srila Janardan Maharaj continued to travel and preach on behalf of Srila Govinda Maharaj and his relationship with him developed more and more and became deeper and deeper as the years went by. Srila Janardan Maharaj would visit India regularly and personally collected donations on behalf of the central Math. He would also participate in the Sri Chaitanya Saraswat Math Nabadwip Dham Parikrama in a glorious way bringing so much inspiration to the devotees and much joy to Srila Govinda Maharaj’s heart.